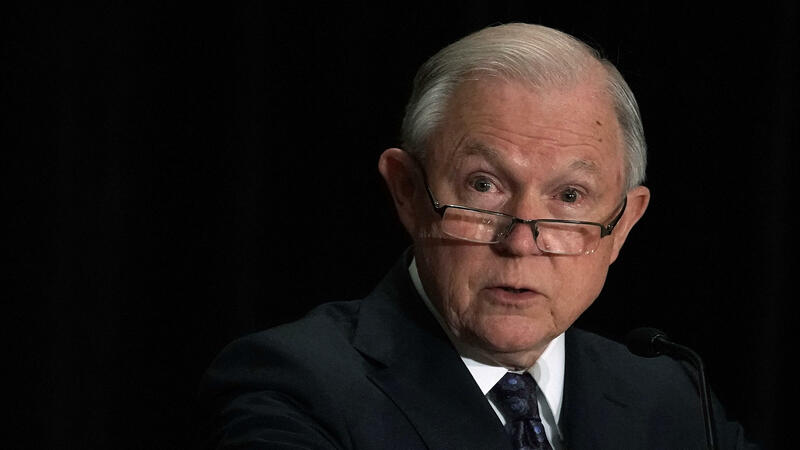 Attorney General Jeff Sessions spoke about his plan to limit the reasons for people to claim asylum in the U.S., at a Justice Department immigration review training program on Monday in Tysons, Va.
As attorney general, Sessions has broad powers over the nation's immigration courts. He can take on cases of individual immigrants, as he did in this case of one woman from El Salvador. And his decision sets precedent for the entire U.S. asylum system, so it has implications for thousands of asylum-seekers. Immigrant rights advocates say Sessions' decision runs counter to years of established precedent. They fear the lives of asylum-seekers will be in danger when they are returned to their countries of origin. "The decision itself really is looking to dial us back to the dark ages, before we really recognized women's rights as human rights," said Blaine Bookey, a lawyer at the Center for Gender & Refugee Studies at the University of California Hastings College of the Law. Bookey represented the Salvadoran woman in the case before the attorney general. In his decision, Sessions argues the asylum system is intended to protect not victims of violent crime but people fleeing from persecution, like religious minorities or political dissidents. "We all know that many of those crossing our border illegally are leaving difficult, even dangerous situations," Sessions said. But he said his decision would restore "sound principles of asylum and long-standing principles of immigration law." Sessions and other immigration hard-liners say that it has become too easy to claim asylum in the United States — and that migrants know this. "I do agree with the attorney general that certain asylum-seekers were gaming the system in order to gain entry into the United States," said Andrew Arthur, a former immigration judge who is now a fellow at the Center for Immigration Studies, which favors lower levels of immigration. Immigrant advocates, however, say Sessions is taking away an essential lifeline for victims of domestic abuse and gang violence and turning his back on an American legacy of protecting the most vulnerable. Immigration lawyers have worked for decades to help domestic violence survivors from Central America, where the problem is pervasive. They argue these women deserve asylum because they're persecuted by their husbands and ignored by their own governments. The Salvadoran woman whose case Sessions took on spoke out for the first time to NPR last month. She asked to remain anonymous because she still fears her abusive ex-husband. She is known in court papers only as Ms. A.B. She said she feared for her life after suffering more than a decade of abuse and that police in El Salvador refused to help her. Ms. A.B. fled to the United States and applied for asylum. She fought her case to the Board of Immigration Appeals, which sided with her. But then Sessions intervened. He ruled against her and sent the case back to an immigration judge to order her deportation. "We've spoken with Ms. A.B. herself, and she's incredibly fearful as you can imagine," Bookey said. "And there are lots of Ms. A.B.s out there that will be really at risk of deportation to their possible deaths." Ms. A.B. 's lawyers say they plan to challenge Sessions' decision in federal court. In the meantime, Sessions says that he hopes his message is reaching would-be asylum-seekers in Central America and that they think twice before traveling to the U.S. border. "The world will know what our rules are, and great numbers will no longer undertake this dangerous journey," Sessions said Monday. In recent months, there has been a surge in the number of immigrants trying to cross the U.S.-Mexico border. Immigrant rights advocates say that is because they're fleeing extreme violence in their home countries — violence that shows no signs of abating. Attorney General Jeff Sessions is imposing sharp new limits on who can get asylum in the United States. Under the changes, most asylum seekers fleeing domestic violence or gang violence will not qualify. Here's Sessions speaking this morning at a conference of immigration judges. JEFF SESSIONS: Asylum was never meant to alleviate all problems, even all serious problems that people face every day all over the world. So today, I'm issuing a decision that restores sound principles of asylum and longstanding principles of immigration law. CORNISH: Immigrants' rights advocates say this decision runs counter to decades of established precedent. And they say thousands of people could be in danger when they return to their home countries. Joining me now is NPR's Joel Rose. And Joel, I know the attorney general's decision came as part of a ruling in a particular case that you've actually been covering. Bring us up to speed. JOEL ROSE, BYLINE: Well, sure. As attorney general, Jeff Sessions has broad powers over immigration courts. He can reach down into any individual case he wants and set precedent for the entire system. And here, Sessions intervened in the case of a woman from El Salvador. She's asked to remain anonymous. And she's known in court papers as Miss A-B. I interviewed her last month, and she described suffering more than a decade of abuse by her husband. He hit her and raped her. Finally, she fled and applied for asylum in the U.S.
CORNISH: Now, Sessions decided against her. What does that mean for other domestic violence survivors? ROSE: Well, in short, it means that most of them will no longer be able to qualify for asylum here. That's after decades of fighting in court to be able to get these protections in the first place. And it's a big deal because with asylum protections, these women were able to stay in the United States and get a path to citizenship. CORNISH: Help us understand how this worked, though. I mean, what was the argument they were able to make saying that they did deserve asylum? ROSE: OK. This is where it's going to get a little technical but bear with me. In order to get asylum, you have to show persecution on account of race, religion, nationality or political opinion or persecution based on membership in what's called a particular social group. Immigrant rights lawyers have argued specifically that domestic violence survivors from Central America can qualify as members of a particular social group because domestic violence is such a pervasive problem there. And these women have not only been persecuted by their husbands, their own governments are unwilling to protect them. So the abusers know that they'll get away with it. And U.S. immigration courts have gradually come to accept this theory that these women can be part of a particular social group, and it seemed to be settled law, although now Jeff Sessions has overturned that precedent. CORNISH: And what is the argument from the attorney general on that? ROSE: He concedes in his decision that the abuse Miss A-B and other domestic violence survivors report is quote, "vile," but he says that people all over the world are victims of private crime, of crimes of violence, and that we can't accept all of them. And in fact, Sessions argues that people are actually - asylum seekers have actually been gaming the system and coming here because it's become too easy to get asylum. In fact, he said this morning that hopefully this ruling will discourage people from making the dangerous journey to the U.S. in the first place. CORNISH: And the reach of this ruling, how many people affected? ROSE: It's hard to say in hard numbers. Nobody tracks the exact reasons that people give when they ask for asylum, but it's probably in the thousands.